We are very proud to have been featured in not one but two Etsy Treasuries last week! 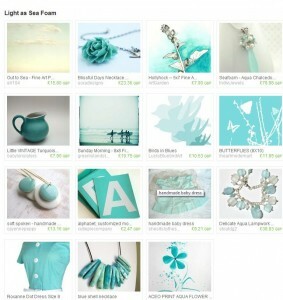 The first called Light as Sea Foam was by RavensWhimzy and as you can see below featured gorgeous items in shades of aqua including our very own gemstone and pearl Sea Foam Necklace. 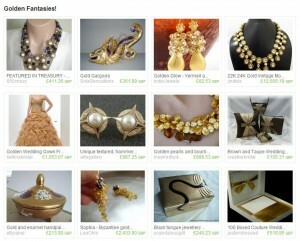 The second treasury was called Golden Fantasies and was created by 650crissy This treasury featured our Golden Glow – Vermeil and Crystal Quartz Earrings alongside a number of other stunning products in gold. Many thanks to both of you for taking the time to feature our products. 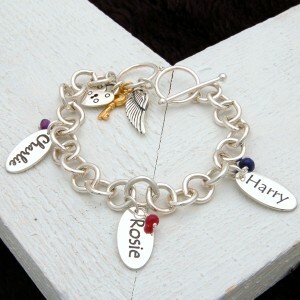 Well its pretty late and I am not having the best of weeks, Its taking me most of the night to get our new personalised bracelet on because i know nothing about computers and all the gadgets that make them work. I think i need to go on a course but then again that’s all well and said but i just don’t have the time. If things couldn’t get any worse i have been waiting for my lovely pearls which i have now found out seem to be lost just as i need them most as i have a couple of designs i needed them for. Time will be very restricted in a few weeks as Sue will be giving birth to our new baby boy yeah i know we cheated we found out earlier so we could prepare but we still cannot decide on a name so if anybody thinks of one let us know. If anyone wants to join us on our facebook page then come along and become a fan as we are giving away free goodies when we get to our first one hundred fans and then again at 200, 300, yeah you get the picture so what you waiting for pop along and become a fan. We have been pretty busy this week with other jobs, cleaning the car which hadn’t been done since our holiday and had half a ton of sand in it, a few old jobs round the house, and catching up on some admin work so its been pretty quite in the workshop this week although lots to do but sometimes you just need to take your foot off the gas which is why me and my two boys (soon to be three) Archie and Broxi (yes that’s the dog) have been going on some forest walks. 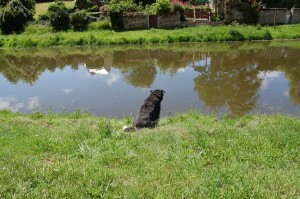 I will leave you with Broxi fishing YES fishing on our recent holiday in France so bonne nuit. Sunday night again! just cannot believe how fast the days go I am sure they used to go really slow when i was younger. This weekend has gone really quick as i have been building a sandpit for my boy, its all finished now just need some sand. I think i got my measurements wrong its huge but i don’t think my lad will complain though. I decided to build him one as the ones i have seen in the shops are pretty small and look lie they will snap after a week so i built one that will last for years lol. We didn’t get much time this weekend to work on the business but we did manage to get our new personalised bracelet on the website which we are very pleased about. All this miserable weather doesn’t help because i like to take my photo’s in natural light and it wasn’t easy on Friday but managed to get a few but i will take some new ones when the weather gets better. 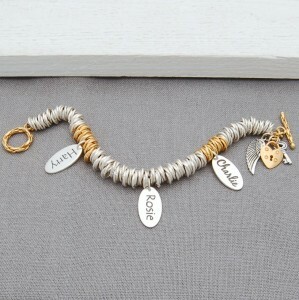 Our personalised necklace is one our best sellers and we have had a few enquiries about personalised bracelets as not everybody likes to were necklaces so we got to work designing a bracelet which as you can see is very elegant and stylish. 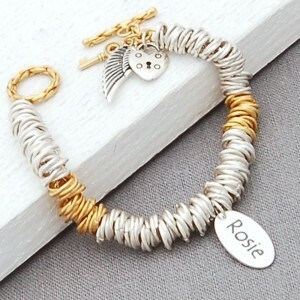 For the bracelet we didn’t think a thin chain would work we wanted one that would stand out and have a look of quality so we went with a chunky cable chain which suits the design. The tags are the same ones we use for the necklace to keep it in the same range. We used an adjustable toggle because we get a lot of customers who are not quite sure what size they are so we thought this would be the best option. 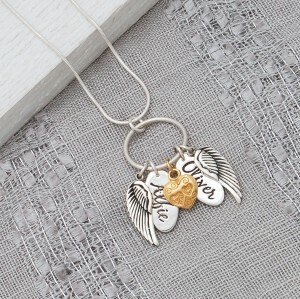 On the toggle we put a lovely cluster of charms which consist of a sterling silver angel wing, a sterling silver padlocked heart and a gold vermeil key which keeps with the theme of the bracelet which is for love of the people past and present in your lives weather it be new babies, family members or friends who have touched your lives this is a great gift that you can keep and remember the good times when you look at there names. OK that’s enough of the Mills and Boons stuff that’s all from me tonight but hopefully will be blogging tomorrow, i wish you a bonne nuit.